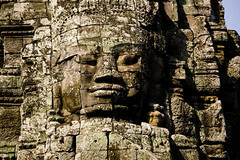 A team of Cambodian and Japanese archaeologists says it has uncovered an ancient man-made drainage system at the site of the Bayon temple at Angkor Thom. The temple, built in the late 12th and early 13th centuries during the reign of King Jayavarman VII, has been the subject of three digs since 1999, but this is the first time such a drainage system has been discovered, according to the archeologists. â€œThe drainage system is for rainwater flow from the first and second levels,â€ said Heng Kamsan, one of the archaeologists. Heng Kamsan said 14 metres of the 70-centimetre-wide drain had been dug up, and that its covering of laterite stone was due to be removed next week.